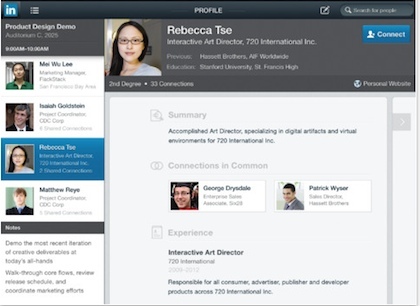 Many of us have had the iPhone version of LinkedIn installed on our iPads. It has worked but definitely designed for a smaller screen. Today we are enjoying what we are calling the ‘full power’ of LinkedIn on the iPad and it’s much different. The layout is much more iPad news like as you can view group and associate’s posts in areas of larger panels that are swept side to side. The previous iPhone version was fine with it’s up/down, most list like interface but the larger side-by-side feel of the new iPad UI is more comfortable to view a lot more options when you want an overview. The ‘new’ version of the LinkedIn app is not a separate app from the iPhone, rather a Universal that has different interactions depending on the device it is loaded on. Of course, still free. 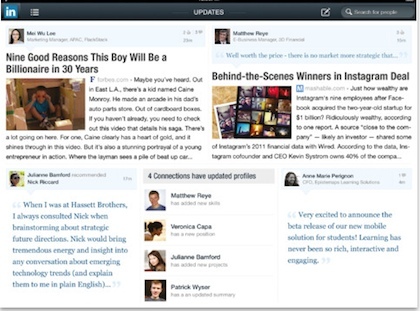 The changes or rather ‘updates’ to the LinkedIn app makes it more of an app you use every day. The previous version was good to glance at as a mobile association linking tool and light news overview… generally clouded with folks that are pushing their twitter posts into the news feed. 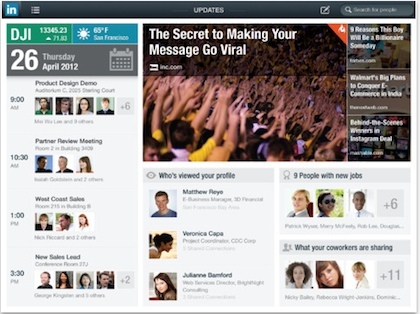 Now, the layout encourages using LinkedIn as a place for links to popular articles of interest as well a unique content source. A major change to the new version of the LinkedIn app is the ability to add people in your associations lists to your calendar. Rather than just having a list of names of people in a meeting, you can have the more advanced information that LinkedIn provides. This ‘puts a face with a name’ of the folks around the table. The LinkedIn app is still a great source to look people up and to connect to people you share work or pleasure with. With the new view, it is much easier to take a quick look at a person’s profile page in meetings when we have visitors. Which is a reminder to all of us, people visiting us for meetings have iPads and the free app to look us up too.